MATTHEW 24:44 KJV "Therefore be ye also ready: for in such an hour as ye think not the Son of man cometh." 41Two women shall be grinding at the mill; the one shall be taken, and the other left. 42Watch therefore: for ye know not what hour your Lord doth come. 43But know this, that if the goodman of the house had known in what watch the thief would come, he would have watched, and would not have suffered his house to be broken up. 44Therefore be ye also ready: for in such an hour as ye think not the Son of man cometh. 45Who then is a faithful and wise servant, whom his lord hath made ruler over his household, to give them meat in due season? 46Blessed is that servant, whom his lord when he cometh shall find so doing. 47Verily I say unto you, That he shall make him ruler over all his goods. Therefore be yee also ready: for in such an houre as you thinke not, the sonne of man commeth. 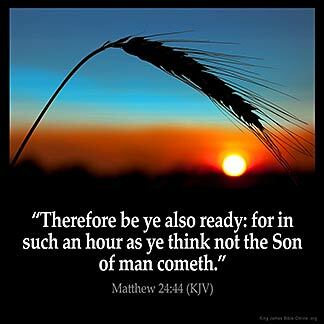 Therefore be ye also ready; for in an hour that ye think not the Son of man cometh. Be ready then; for at a time which you have no thought of the Son of man will come. Therefore you also must be ready; for it is at a time when you do not expect Him that the Son of Man will come. And therfor be ye redi, for in what our ye gessen not, mannus sone schal come. Mt 24:44 Be ye also ready. The duty enjoined is not to watch for Christ, but to watch ourselves to see that we are ready. God is telling me exactly when He is coming in this scripture : When you think not !!! Be prepared and be ready : and be where God placed you. I believe that it means to be ready for Christ at anytime. Live your own life as an upright practicing Christian and never failing in faith. Life is not promised but salvation is and we must keep the faith and be a good example.